PurePro ROYAL RO system is a modern kitchen appliance that has been carefully designed with health consciousness, efficiency, high performance and convenience in mind. PurePro ROYAL RO system uses 100GPD membrane which is powerful, fast and excellent efficiency. 100GPD membrane increase the daily production capacity and the speed of RO water production. This allows for better assurance that there is adequate water available when desired, even during heavy use times of the day. PurePro ROYAL RO with its supreme quality ensures a great water flow rate with absolutely the least wasting of water. Replacing the filters on this system is one of the easiest to do. Quick-Change Filter Cartridges make cartridge replacement fast, clean & easy, without contact with used filter material . No Mess, No Fuss with these filters just remove the old ones and install the new filters. click here for more information. 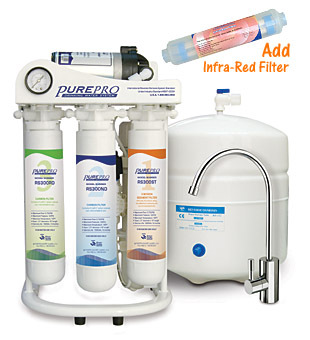 PurePro RS-106A is a super quality 6 stage filter system comes with PureProR USA Alkaline Filter, to offer the very best in water filtration and balanced pH water for drinking. Using reverse osmosis technologies with alkaline filter can actually remove 99.99% of contaminants and provide people with healthy alkaline drinking water. Help minimize the fluctuations of your body's pH. Turn acidic drinking water into alkali calcium ion water. This natural calcium, magnesium, sodium, potassium ions can be absorbed 100% by the body. It is easily absorbed in the body because it has structurally smaller molecules which help the body take in more water and replenish quickly lost water. Makes the water cleaner and healthier. European Style Faucet. Supreme quality with elegant design. This filter improves the qualities of clean water by adding necessary for proper human development and health minerals, such as Calcium, Magnesium, Sodium, Potassium and others readily found in many natural mineral waters.